It’s easy to accuse guitar-playing singer/songwriters of taking the easy way out, but truth be told they face one of the hardest roads in music. Given the limitations of the universal standard 3/4, 4/4, major key compositional foundation, an aspiring folkie or pop bard faces those inherent restrictions and must also do something spectacular to stand out in the veritable ocean of voices. 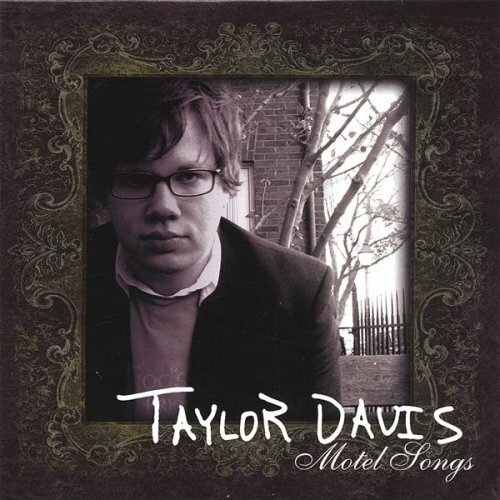 On Motel Songs, Dallas-based Taylor Davis not only acknowledges and accepts the challenge but fully embraces it, peppering his work with liberal doses of an old man’s wisdom and a young man’s rage. Davis’ brand of guitar-driven pop rock never veers too far from the formula, but in the case of these twelve tracks, that actually works to his advantage; free from the need to reinvent the genre, Davis is able to focus on the songs rather than the execution, and this boundary awareness gives Motel Songs the feel of a diligent craftsman’s work. Not polished, but sturdy; not progressive, but not without a sense of adventure, either. The songs of Motel Songs are generally either dour ballads or driving rockers, and while the former don’t quite falter, it’s on the latter where Davis shines, his semi-flinty “yelled whisper” vocals meshing supremely against his lean song structures and a lyrical sensibility best described as Hemingway-esque (fitting then he closes the album with the reflective misery of “Hemingway Life”). On “Run Away,” bare-bones piano lines and e-bow-flecked guitars accent Davis’ full-out rock star yearning (“I want you so bad I can hardly breathe”), while “In My Head” has Davis lyrically breaking his own heart on a trip down memory lane over rollicking tambourines, an army of organ backed-guitar and a cleverly placed yet craftily subtle synth lead. Even though the rockers are the stronger tracks, Davis still shows he knows a thing or two about crafting a slow number. “Home from Hollywood,” the album’s emotional centerpiece and a relative epic at near six minutes, paints a crushing picture of a vaguely distant relationship with sparse piano and lap steel guitar. Davis’ wailing may not be perfect, but his conviction more than overcomes this. For sake of comparison, Davis could best be described as the equivalent of early Josh Rouse doing a slightly more rocking reinterpretation of the ballads of Elvis Costello, but in Davis’ case the comparisons fall short. His format may be widely utilized but through innate talent or sheer force of will, he’s found a style all his own.